Went to her new home on Sunday 24th March 2013. 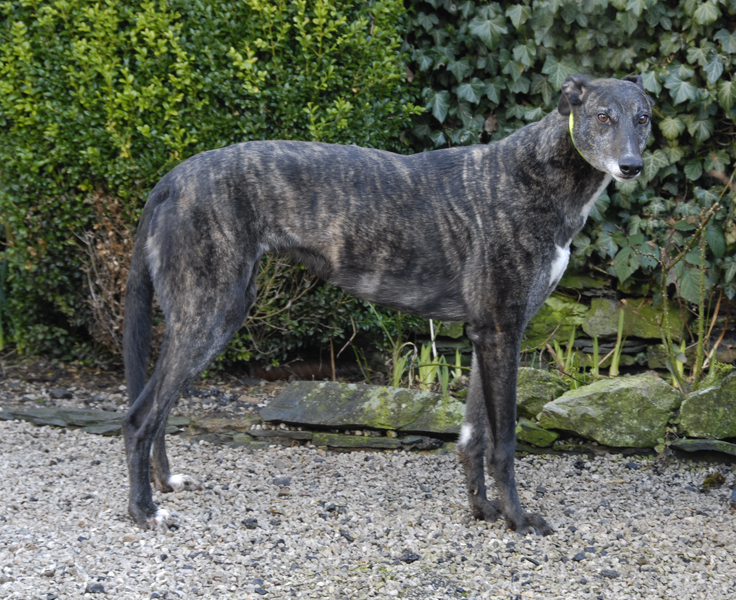 Penny is a beautiful dark brindle ex-racing greyhound who was born on the 15th September 2008. She has a quiet nature, is adorable and loves cuddles and affection. 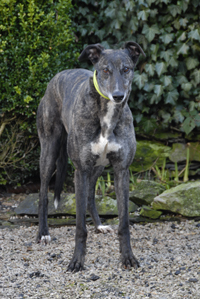 She is microchipped, house trained, walks nicely on the lead and passes other dogs when out walking. We found Penny and Shamus sleeping together in the kennel - the first time we'd seen this. Yesterday we noticed a little blood on the bedding where Penny slept. After examining her we couldn't find anything and wondered if it may have been one of the other dogs who wandered into her section while they were exercising. However, this morning we found more and still not finding any cuts on her I got a tissue and dabbed her bottom - low and behold the blood was coming from there - she had started her season. This is going to be fun with a whole dog and a recently neutered dog being kennelled with her, and two recently neutered dogs in the house! Although Penny sleeps in the kennel at night she now spends the day in the house, which she loves. She had a couple of accidents to begin with, which she did on her bed until we worked out when she wanted to go out and she worked out how to tell us. Penny loves being in the house and she tends to sleep in one of the beds in the kitchen or our bedroom. She was a bit of a monkey at first for jumping up to the work surfaces as soon as we walked from the room. As good as gold if we were in there, but straight up there the second we left. Spraying with the cold water spray, telling her to 'leave' and making her go in the garden did the trick because she no longer does it and we can leave her wandering around now knowing she won't touch anything. What with the weather, my son being ill, my mum passing away and being ill ourselves with colds etc for the past few weeks we have only just got round to taking some photographs of Penny. Penny still sleeps in the kennel most nights although she has slept in the house on a few occasions when it was very cold and while Stuart was away a few days recently. Once she has been fed in the morning she comes in the house during the day with the others. Today has been a lovely day and the first one where I've been able to leave the conservatory door open and they were all able to wander in and out at will during the day - the first time they have been able to do that, this year. 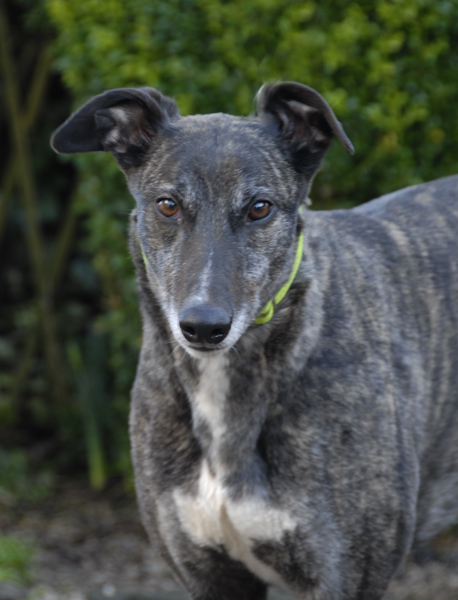 Penny has a nice, sweet nature and loves being cuddled and receiving affection. She much prefers to live and sleep in the house rather than the kennel, and when its time to put her kennel coat on in the evening and take her back there she hangs back and looks very sad. Once in the kennel though, she very quickly settles, but she certainly knows how to do the 'guilt trip'. This afternoon Penny took a trip to the vets for her second inoculation. She weighed in at 31.3k, so although she is quite small she is of a 'chunky' build. With her coming in 'season' a couple of days after arriving here, and it being supressed the vet suggested she be spayed the middle of March. She was as good as gold in the vets, travelled well with the others in the car and was glad to be back home and strolling round the garden waiting for her tea with the others. She's a real little sweetie and when in the house we hardly know we have her. In the kennel she will sometimes give a bark to let us know it's breakfast time and time she was out and in the house enjoying the home comforts with the others. of our garden is where Penny and its other resident(s) will live until they are either re-homed or move into a foster home to await re-homing. 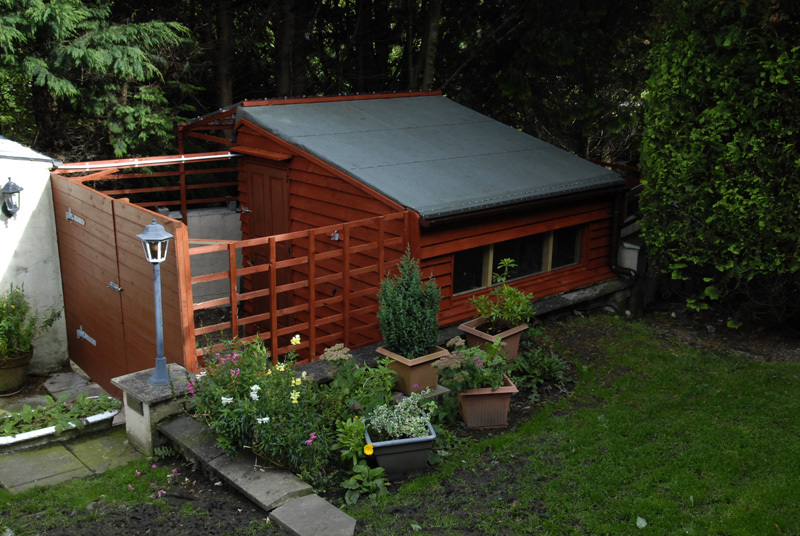 He/She will have use of our garden and paddock at regular intervals during the day, and come into the house on occasion as well as the area around the kennel itself. where, so she doesn't look at her best at the moment. Penny's coat and skin has been so bad the past few days I was contemplating giving her a bath once all that thick loose kennel coat had come off. Now I'm not sure she needs it, her coat has come up really nice and shiny, can't see much loose skin and her coat is now a shade darker than before. She seems to look different - it's not just her coat is looking so good, but she seems to have toned up as well. When she arrived she was a little over weight, which looked worse with her thick coat. I've been watching how much food I give her carefully so as to help her loose the excess weight slowly. This week the weather has been nice for the first time so we've been leaving the conservatory door open all day for the dogs to come and go. I think Penny has been enjoying this and running round the garden and field has toned her body. She's looking the best she's ever looked since she arrived. 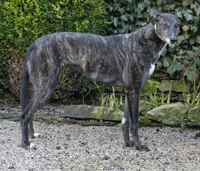 Treacle went of to his new foster home this morning and both Dee and Chloe went to their forever homes. Not sure which one Penny is missing, but since they went she has been quite unsettled. Stuart said that while I was having a nap before tea she kept wimpering and pestering him. When I got up she was still wimpering and wanted cuddles from me. When we put her in the kennel around 10pm and checked her on the camera we found her asleep with Shamus. Bless her, but someone she'd made friends with wasn't here anymore and its upset her. This morning Penny went to the vet to be spayed where she weighed in at 30.4k. This is good as it means she has lost a kilo in weight since arriving here, which is something she needed to do, and she looks much better for it. While waiting in the vets waiting room there was a rather noisy small dog - Penny wanted nothing to do with it and wanted to leave the room it was in. A good sign! This afternoon we took Penny over to her new home where we hope she will have a long and happy life. Received an email today letting us know that after we had gone yesterday her new owners took the dogs down the lane for a gentle stroll. Fen poohed and peed!! They then had their dinner which Fen wolfed down and then proceeded to finish off the little bit Flash had left. Dan took them in the garden at various times from then on. She is walking about whining quite a bit but eventually goes on her bed and sleeps. I guess she is missing all her pals and Flash is not the most giving of creatures. Last night when they had the TV on she stayed with them in the sitting room for a while and then came into the bedroom where Flash was asleep and lay on the carpet near him. They put her bed in the corridor between the two bedrooms where she could see Flash and both of them and she settled down well. They had their treats and that was all we heard of them all night. This morning, having gone to sleep earlier than usual, they awoke at 6. 30am. They waited a while and let them out whereupon Flash had a good bark and so did Fen. She was very excited to be off the lead. Luckily their neighbours are early risers!! They both came in quite happily and then she whined quite a lot until they got up when she settled in the dining room and went to sleep. Dan took them for a walk and then they fed them. Once more, Fen wolfed it down and looked for more! Eventually, she went to sleep and has just been out for a widdle and to look for pheasants in whom she is very interested indeed. Her new owner will now give them a treat each and soon she will have been with them for the first 24 hours which must be so confusing for her. Tiger was so laid back and of course older when he first came but they are sure Fen will settle soon. Don't worry about her! We heard today that the little lass is fine. Much more settled today with hardly any whining and eating very well indeed!! She settles at night and there isn't a peep out of her until they both wake up at around 7a.m. Just a bit of a whinge this morning and then she settled in the dining room whilst Dan had his breakfast, then walkies and a meal. Her owners then decided to go to Asda and left Flash and Penny their treats and were gone about two hours. She was delighted to see them and there had been no chewing or other signs of distress. She did have a quick belt round the garden after the pheasants which fascinate her, but then she had a good sleep and they could see her stitches were okay. Dan was out with her at the time but couldn't stop her from giving chase. Fen, as she is now called, is very settled in her new home, and just wakes up once during the night, whines a bit to her new owner who then goes to the loo by which time she has settled down again. This morning it was 7a.m. when she was let out. She has her "race track" sorted out in the garden and goes for a good run a couple of times a day. She gets up on her hind legs to set off which they have never seen any other dog do except their Lurcher who always did it. She is eating VERY well. She sure does love her food. She is quite a loving dog and sometimes tries to cuddle up with Flash on his bed. Needless to say he totally ignores this. She loves to lick you as well which is something Flash hardly ever does. We heard today that Fen has settled very well now. Fen had been doing a lot of running about with some other dogs recently and was quite happy while visiting a couple who may be looking after her for a while later this month. It's a strange thing but Fen has become much quieter since that afternoon and much more loving and even a bit clingy with her owner. She can't think why but there it is. Her owners dread leaving them, but know it has to happen because they both desperately need this holiday. Fen has completely settled now and her new owners love her to bits. She is responding to the love and attention she gets and comes and buries her head against her new mum to scratch her ears. Tiger used to love that as well. She eats very well but now she is less anxious she actually sometimes leaves a few bits in her bowl and then goes back for them later! She loves it if they go in the garden with her, and she tears about like a mad thing just showing off. She actually managed to get Flash to play with her the other day. We heard today that when Fen did her big escape the other week she came back exhausted. After food and a sleep she went to get up and squealed and held one back leg up. They thought she may have had cramp and she soon recovered, but she is still doing it, but not carrying her leg at all now. She is also having a squeal for no apparent reason when on her bed, and they wondered if she had been injured at some time, and her 'escape' had aggrevated an old injur,y or if she hurt herself while out and its taking a long time to heal. It happens only occasionally but she still does do it.They have swapped her night bed over as it was a bit lumpy thinking this may help her. Otherwise she is fine and runs and leaps about in the garden when she can and loves going for her walks. Fen's owner emailed letting us know that Fen has always been keen to take shoes and other things to her bed but now she is taking her empty feeding bowls out into the garden. She has recently started to try and take the big water bowl out too, which they keep in the kitchen. They don't hear her do it but twice they have found the kitchen awash with water!!! She has also started to take her owner's jackets into the garden. She is still whining and they don't know why because she is well cared for and happy most of the time but the whining must mean something and they haven't yet worked out what. We've just heard that as a result of Fen's wimpering when one of her owner's goes out it was felt she may feel better going with him. He took her out today in the car and it was not good!! First of all she refused to get in the car so he had to lift her in. Then he just drove to the garage and all the time she was whining and panting and very distressed. He left her to fill up and then came straight back. She didn't lie down or settle at all and was just a very worried little girl. Not sure they are going to try it again, which is a pity. They have decided to get her a proper dog ball with the dimples because they had a dog once who nearly choked on an ordinary ball, and Fen may play with that. The pet shop had run out however, so they wil get one as soon as they can. In the meantime she will have to make do with slippers, a proper rope dog toy, a squeaky toy and a rubber ring! They think she was unsettled when she first came to them than appeared at first. They know she will settle eventually and she is happy most of the time now. She loves her new bed (much thinner and softer than the old ones) and they bought her a new duvet from the supermarket. She really snuggled last night and didn't wake wake them until 8.10 a.m. !!! Fen has started getting quite upset when one of her new owners was out the house, the wimpering driving her other owner mad. Therefore, I suggested he take her with him when ever he could, but she wasn't keen on that either and wimpered the whole time in the back of the car. Her owners think she thought she was going to be taken somewhere because she was so happy to be back. They love her to bits, but she is such a funny little thing. She is getting a new ball today. We heard today that when the little farm sheepdog comes to visit when the farmer is dealing with sheep in the field opposite our house, Fen goes crazy and leaps around him and tears about - not that he is terribly interested in her! She is still carting all her bowls, slippers etc. outside but her owners just accept it now. Her hip is no trouble at the moment so they haven't seen Ken Woodacre just yet. We heard today that Flash and Fen went to see Ken Woodacre last Thursday. He did a little manipulation with Fash, but gave Fen a good going over by lifting up her hind legs, crossing them over and doing things to her back and hips. They heard all the clicks, which didn't go down too well, but at least Fen is back as she should be again. We received an email today letting us know that Fenny is really fed up in all this awful weather as it's too wet to go in the field. Behind the gate is like a skating rink. She is looking forward to having Sandy and Indi come to stay while we are in South Africa on holiday. We've just heard that Fen Had her boosters today and health check. She is fine and was much better in the car than she has been in the past. We received an email this evening letting us know that the dogs had a quiet first night back after staying with us - not a peep from them. Since then Fen has been busy pinching things from her owners room and they have found slippers, bath sponge and her bowls in the garden!! She takes anything, even off my bed. In addition to Fash being fed up with the decorators being in the house Fen was also totally fed up with her routine being disrupted and wandered around and wouldn’t eat terribly well. They both glared at the decorator once or twice although he loves dogs and has one of his own. The house now looks lovely and clean but there are a few “hairy” doors which Chrisitne says she is not looking at!!! . We heard this evening that Fen's companion Flash passed away with the assistance of the vet around 7.05 pm. Fen watched the proceedings very quietly but after he was removed she started walking round the dining room crying and looking for him, bless her. Her owners are going to be very attentive to her tomorrow and try to give her a good run in the field (weather permitting). Our Star has been staying with Fen and her owners while we are away on holiday. She's loving the companionship, going for walks with him and running round the garden together.